Hit the streets in our electric Low Speed Vehicle (LSV). Our popular alternative to getting around your neighborhood or just running errands, the LSV is equipped with brake lights, turn signals, road-worthy tires and enough pep to be certified legal for roads posted 35 mph or less. 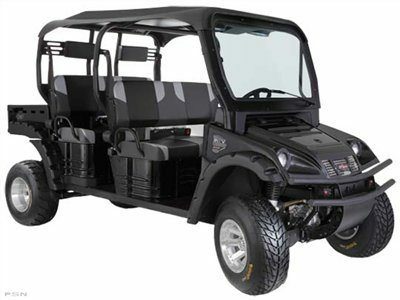 From our new two-wheel drive, two-seat runabout to the fully-equipped four passenger 4 X 4, lies the heart and soul of the same powerful and durable Bad Boy Mowers Utility Vehicle that’s been blazing new trails since our beginning. 7.75 in. from lowest point of frameAt Frame: 14.5 in. 6.3 cu. ft. / 500 lbs.